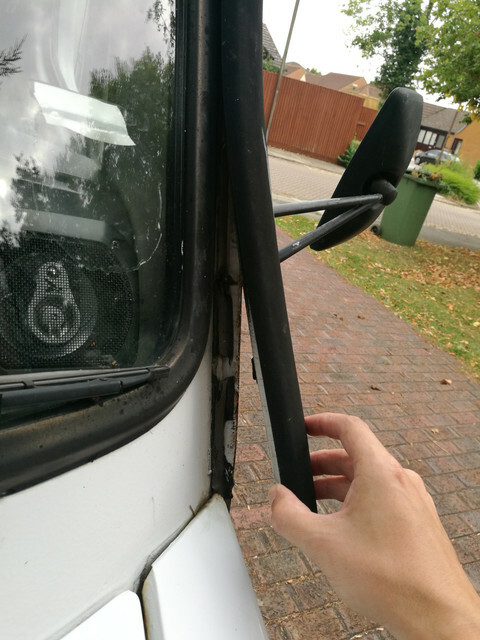 You know that feeling when you're absolutely positive that you saw something move out the corner of your eye, but can't see it when you look properly? That happened to me a few times in the last few days when driving... finally got around to investigating yesterday. Yep, this looks like the culprit. The original(?) sticky foam backing had disintegrated so was removed. I've stuck it back down with some double sided tape for now. 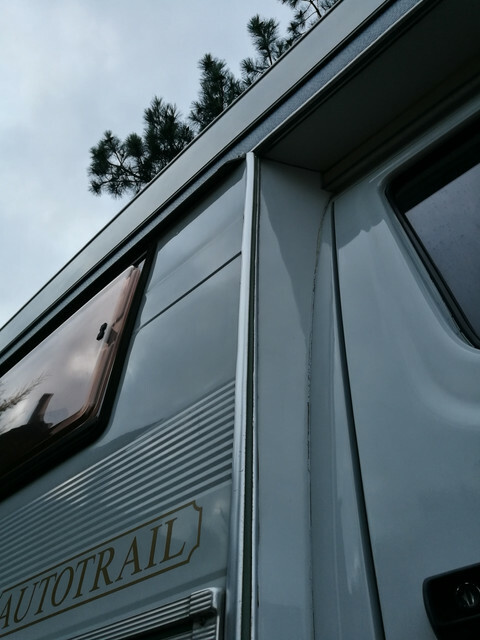 Once I know I don't need to get the trims off again I'll stick them down with Sikaflex (which will also act as a nice seam sealer to stop water getting into the panel joint hidden under the trim). 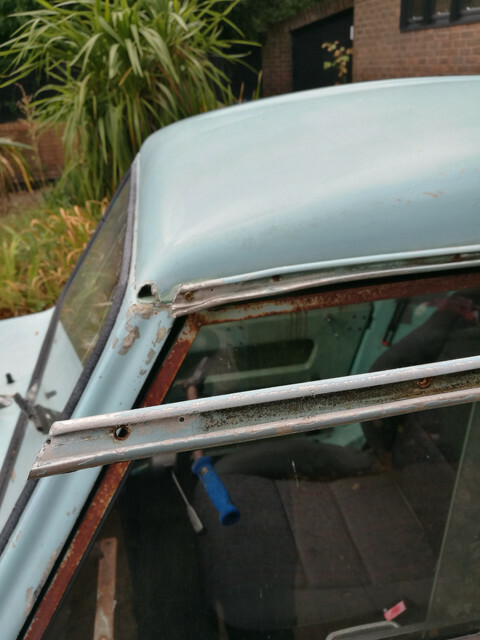 Pulled the nearside gutter/roof trim off the spares Invacar to replace the mangled one on the project car. 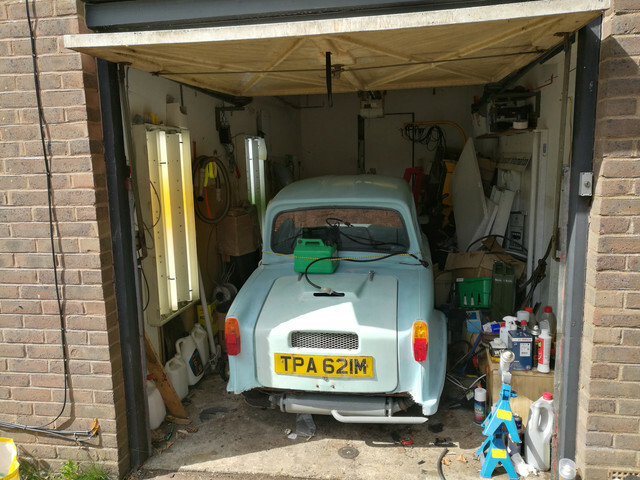 Also finally got around to clearing enough junk out of the way so I could wheel the spares car out of the garage, stuff it in a corner under a tarp, and finally actually put the project car in the garage where it belongs. 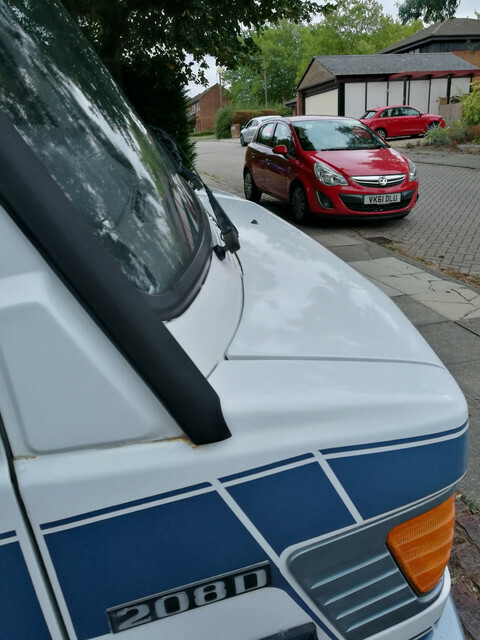 It was starting to worry me just sitting out front the way it was, no security whatsoever (the lack of door handles meant there weren't even any door locks) and just waiting to be nicked...so happy it's in the garage now. 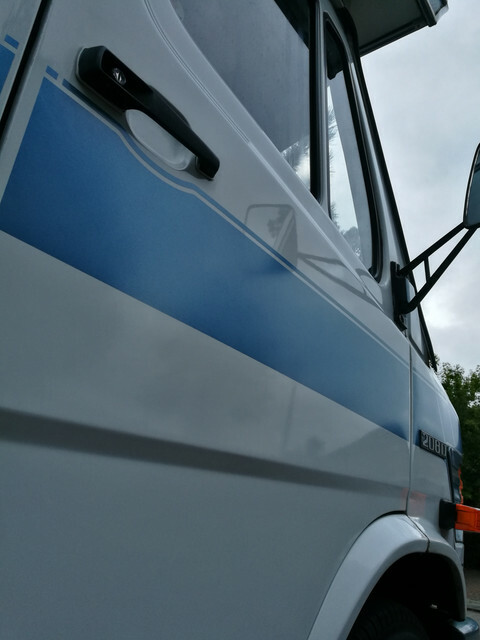 Also finally got a chance to give the van a good going over externally, starting to actually clean it. Attacking the bonnet with the polish and clay mitt shows that there is actually some decent paint down underneath the oxidisation. ...Will take a while to go round the whole thing though! Given I'm trying to sell the Lada, it looking like it had been dragged through the Amazon rainforest all the time was less than ideal. With the Invacar shifted into the garage, it was released from the prison under the tree, so I gave it a wash. Desperately needs a good wax, but isn't green any more at least. Need to get a proper sign made up anyhow to replace the 30 second job currently in the window. Have also continued with the mission to clean the van up. Feels like we're getting somewhere now. The van was originally running the tyres at 48/51psi as per what was written on the back of the handbook. This didn't tie in with the recommendation actually on the vehicle information plate which says 56/65psi (front/rear). They've always looked a bit soft, so I tried that pressure. Road manners are transformed, rolling resistance obviously reduced and the steering at parking speeds is now merely heavy rather than ridiculous. On the move there's actually some steering feedback as well. Will be curious to see if it affects the economy visibily, though it's already surprising me on that score by hovering just under the 30mpg mark. The Lada has had an issue for quite a while now with a high and lumpy idle to the extent that it sounded like it was running on three cylinders. I'd done a quick check for leaky vacuum hoses and didn't find any. Today though I checked more thoroughly - and around the manifold. Sure enough, there was a leak on the front branch of the inlet manifold to head joint. Nipping the nut job slightly immediately dropped the revs to a sensible level and smoothed the idle right out. If only all problems were that easy to fix! I gave all the fasteners around both manifolds a check over too, so hopefully we won't have a repeat performance. Definitely feels better to drive (the transition between coasting and under power has been smoothed out) now, and traffic is far easier now the idle speed is rather more sane. Plus the very occasional idle speed error that was being logged hasn't reappeared yet, so hopefully that was being caused by the leak. Makes sense as the reported engine speed wouldn't correlate properly with the known throttle position, idle air control valve position and injector duty cycle. Will definitely be trying to use it a bit more in the next few weeks now the weather has cooled down to a more sensible level. I do wish that we could get one of the standard 1.5E Rivas along and do a road test of them both to see how much difference there is to drive with the injection kit fitted in the real world, especially now I've got it pretty close to fully working properly (think the vehicle speed sensor is the last thing needing sorting now). Would be interesting to see if it's as much a shame you couldn't buy the car I've put together from the factory as I think it was. 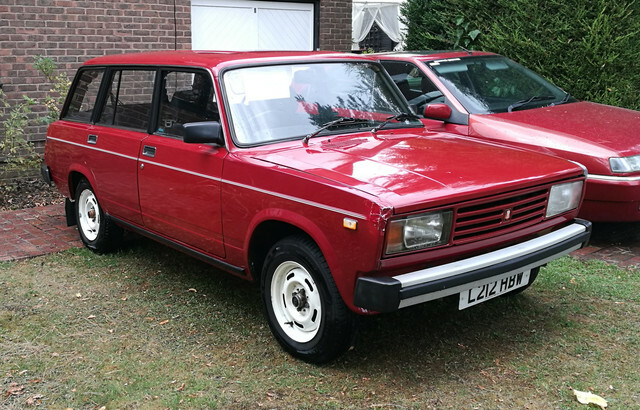 Had the Lada out and about in town in actual use today and can confirm that it's running so, so, so much better with the vacuum leak sorted out. Should have spent half an hour sorting that six months ago... it's actually nice to drive now rather than just stressful. 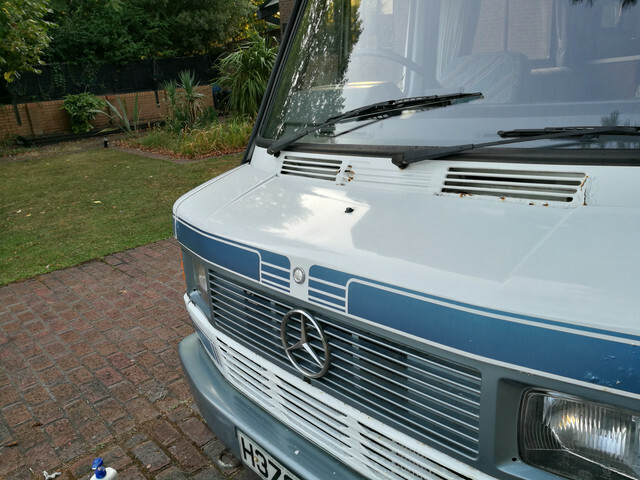 Hopefully will get it out on the open road shortly and see how it goes. Anyone want a random video of the area around MK from a ride onboard the Riva? Sounds like an excuse to test out the off-brand-but-well-reviewed Go-Pro knock-off we mainly got for the dog then. Will find somewhere to attach it and go for a spin. Probably do the same in the van as the first try there was dire. Used my phone directly fixed to the dash, and the vibration basically made the anti shake algorithm have a fit. Granted, not tried it with the new one which has proper optical image stabilisation, so might fare better. As requested, here's the video footage from a quick run from a retail park just outside the centre of MK over to Buckingham and back. Haven't actually viewed the footage myself yet other than a quick glance at it to prove it wasn't corrupt. Looks a bit shaky, I might have another shot with the camera secured to something a bit more solid, there's more wobble in the window mount than I'd ideally have liked. First time I've ever used that camera as well, so it's a bit of an experiment. I've got a similar video from in the cab of the van, I'll have a shot at getting that uploaded soon. That would appear to be a very smooth ride indeed. My own Lada 1500 Kombi, a late (1985, pre Riva shaped) one on a B plate, would have been much louder inside, much less stable in a straight line and generally a far less pleasant place to be, even on the rare occasions when its timing chain hadn't detensioned itself and started rattling yet again, as was its habit. The camera may well be a little shaky on the straight roads, but when you're coming out from the car park at the start of episode one, the speed humps don't seem to upset the car's suspension at all, again my own - not massively missed - Lada would have been bouncing around all over the place. This leads me to believe that your car is simply better than most of its sort but maybe my Kombi was just a bad example? 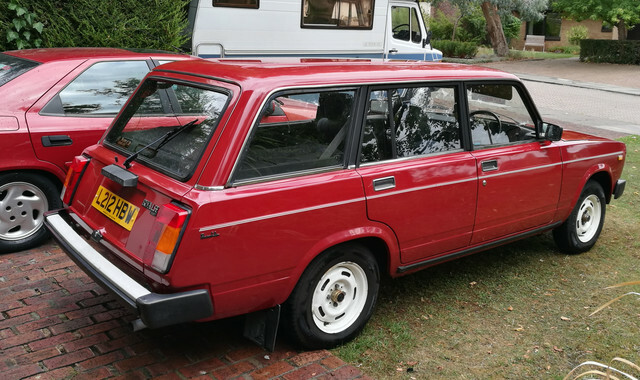 I also owned a 1500 saloon but only drove that on the road to get it from Windsor to Aldershot, where it was to be hacked about, fitted with a fire extinguisher instead of its radiator, robbed of its interior, glass and even the radio. I saw this as a funeral worthy of a true hero - on the track! I still feel the shame some thirty years on! It's not quiet by any means but not uncomfortably so. It's an odd behaved car at speed in that it's far happier, smoother and more stable at an indicated 75mph than 55-60. She is astonishingly happy on the motorway - especially now the injection kit is working well. Being honest, with the way the torque curve is now, it would be more than happily handle an extra gear. The camera seems to have made it sound far more boomy than it really is, not sure what I can do about that really... really don't know why finding a camera with a decent mic seems to be so hard. The estate seems to be slightly more firmly sprung than the saloon, the saloon based on my experience...though I'm possibly slightly biased there given that the other car I've spent most time in lately is a green blooded Citroen! Or the van, which while on leaf springs all round, being probably north of two tonnes it actually rides surprisingly comfortably.